^ No more walking in a 'Burgcamp' Wonderland. Financial Times. 2006-04-28 [2012-04-29] （英语）. ^ There was only one Dennis Bergkamp. The Independent. 2006-07-22 [2016-12-18] （英语）. ^ 4.0 4.1 4.2 4.3 The Big Interview: Dennis Bergkamp. The Sunday Times. 2004-11-14 [2012-04-28] （荷兰语）. ^ Op een mooie zondagmorgen. Geuzenmiddenmeer. 2006-08-22 [2012-04-28]. （原始内容存档于2012-12-01） （荷兰语）. ^ Dennis Bergkamp factfile. Sporting Life. 2002-12-19 [2012-04-28] （英语）. ^ 8.0 8.1 Dennis is worth wait in gold; The FA Cup quarter-finals: Bergkamp has not played too often, but he's still producing masterpieces. The Mirror. 1998-01-02 [2012-05-01]. （原始内容存档于2013-01-25） （英语）. ^ Ajax 2–0 Roda JC. Voetbal International. [2012-04-28] （荷兰语）. ^ Ajax 6–0 Haarlem. Voetbal International. [2012-05-03] （荷兰语）. ^ 1986/87: Ajax revive their traditions. UEFA.com (Union of European Football Associations). 1987-06-01 [2012-03-14]. （原始内容存档于2010-05-03） （英语）. ^ 1991/92: Ajax complete clean sweep. UEFA.com (Union of European Football Associations). [2012-05-11] （英语）. ^ Ajax – sc Heerenveen. SC Heerenveen. [2012-05-11]. （原始内容存档于2013年5月11日） （英语）. ^ Deze week ... 17 jaar geleden. Ajax.nl. 2009-02-11 [2012-05-11]. （原始内容存档于2012-10-21） （荷兰语）. ^ Cruyff: "¿Qué va a hacer Bergkamp en el Real Madrid?". El País. 1993-01-02 [2011-12-12] （西班牙语）. ^ 16.0 16.1 16.2 Dennis Bergkamp – One-on-One – Interviews. FourFourTwo. [2011-12-12] （英语）. 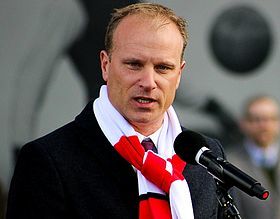 ^ 17.0 17.1 17.2 Football: Bergkamp joins Inter for 7.1m pounds. The Independent. 1993-02-16 [2011-12-12] （英语）. ^ Jonk e Toto' fanno ridere l' Inter. Corriere della Sera. 1993-08-30 [2011-12-13] （意大利语）. ^ Football: Wright faces charge: FA awaits linesman's decision. The Independent. 1993-11-23 [2011-12-14] （英语）. ^ Inter sack coach Bagnoli. New Straits Times. 1994-02-09 [2011-12-14] （英语）. ^ 1993/94: Inter reclaim UEFA Cup. UEFA.com. 1994-06-01 [2011-12-13]. （原始内容存档于2011-11-10） （英语）. ^ Bergkamp Baggio, magie da 10. Corriere della Sera. 1993-09-17 [2011-12-14] （意大利语）. ^ Unravelling the enigma that is Dennis Bergkamp. The Independent. 1995-06-21 [2011-12-14] （英语）. ^ Che incubi a Milano Il riscatto dei ripudiati. la Repubblica. 2000-06-27 [2011-12-14] （意大利语）. ^ 1995, Moratti compra l'Inter. Corriere dello Sport. 2011-02-18 [2011-12-14]. （原始内容存档于2013-12-03） （意大利语）. ^ Player Profile, Dennis Bergkamp. Premier League. [2011-12-15]. ^ Football: Dennis Bergkamp. Footballdatabase.eu. [2011-12-15]. ^ Dennis Bergkamp. National-football-teams. [2010-08-05] （英语）. ^ Dennis Bergkamp – Goals in International Matches. RSSSF. [2011-12-13] （英语）. ^ International FIFA 13 Covers. fifauteam.com. 2012-08-24 [2015-03-18] （英语）. ^ Fifa 14: Ultimate Team Legends list for 2014 game. Daily Mirror. 2013-09-10 [2015-03-18] （英语）.